This modern designed Standard Room comes with a Standard Double Bed or Two Separate Standard Single beds. Free unlimited Wi-Fi Access in Rooms. 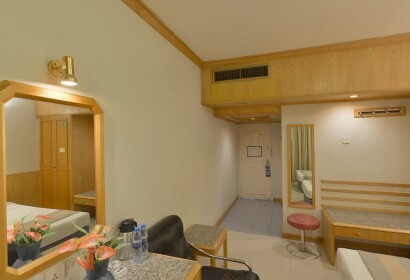 All Standard Rooms are equipped with Air Conditioning, Bathtub or Shower; Remote controlled Flat Screen LCD, Electronic Safe Locker, Hot Water Kettle, Direct dial Telephone, Refrigerator. Enjoy a luxurious night's sleep in one of our spacious Deluxe Room! Each room comes with a large King Size Bed with comfortable sitting area. Free Unlimited Wi-Fi acess in Room. All Deluxe Rooms are equipped with Air Conditioning, Bathtub or Shower; Remote controlled Flat Screen LCD, Electronic Safe Locker, Hot Water Kettle, Direct dial Telephone, Refrigerator. Enjoy a luxurious night's sleep in one of our spacious Executive Suites! Each room comes with a large bed room & Living Room.Bed room comes with King Sized bed & bathroom.Living room comes with Large Sofa seating & dinnig area. All Executive Rooms are equipped with Air Conditioning, Bathtub or Shower; Remote controlled Flat Screen LCD, Electronic Safe Locker, Hot Water Kettle, Direct dial Telephone, Refrigerator.